Timeless: Cancel or Renew the NBC Series for Season Two? Tonight, NBC’s Timeless TV show finishes its first season. While the writers clearly have plans for a second season, NBC may not. The peacock network has yet to renew the series for season two but, they haven’t cancelled Timeless either. Will it be back for the 2017-18 season? Should NBC renew it? Would you watch? An action-adventure series, Timeless begins as a mysterious criminal (Goran Visnjic) steals a secret state-of-the-art time machine, intent on destroying America by changing the past. The country’s only hope is an unexpected team of a history professor (Abigail Spencer), a soldier (Matt Lanter), and a scientist (Malcolm Barrett) as they embark on the adventure of a lifetime to stop the villain. The rest of the cast includes Paterson Joseph, Sakina Jaffrey and Claudia Doumit. Airing on Monday nights, NBC gave Timeless a solid timeslot, following their biggest TV series, The Voice. The series premiered on October 3, 2016 and drew a 1.83 rating in the 18-49 demographic with 7.60 million viewers. While those are good numbers, the network was likely disappointed that they weren’t higher — especially when the trailer attracted nearly 300 million views. In week two, Timeless’ ratings dropped 22% in the demo and 18% in viewers. The numbers have been up and down since then but they’ve been trending downward. Recent episodes have dipped below a 0.70 demo rating and have drawn fewer than three million viewers. That’s not a good sign for an expensive drama that’s airing on a major network. NBC may renew Timeless for a second season but it seems far more likely that they’ll cancel it and hope that their next post-Voice series brings in big ratings like The Blacklist once did. But, what do you think? Should Timeless be cancelled or renewed for a second season? Would you watch season two or, are 16 episodes enough? Timeless: Cancelled or Renewed for Season Three on NBC? Timeless: Has the NBC TV Series Been Cancelled or Renewed for Season Two? This is such a GREAT show all the questions will BUG me like really Lucy’s mom is a part of Rittenhouse!!! Gia has visions that doctors can’t fix like is her visions fork the past or future can she see into the future??? and Lucy and her sister When it was the 1st episode I thought to my self I can’t wait to get to know te sisters and everything about her and she disappears WHAT? How do they get her back and Lucy and Wyatt ❤️ nice please RENEW!!! Don’t take my Favorite show away it’s too good ik theirs a lot of everything to pay for and all but TRUST ME it will be worth it!!! Don’t cancel Timeless because it takes us back in history. The show makes me look up the events and read about history. And besides James Bond is hot for Lucy. 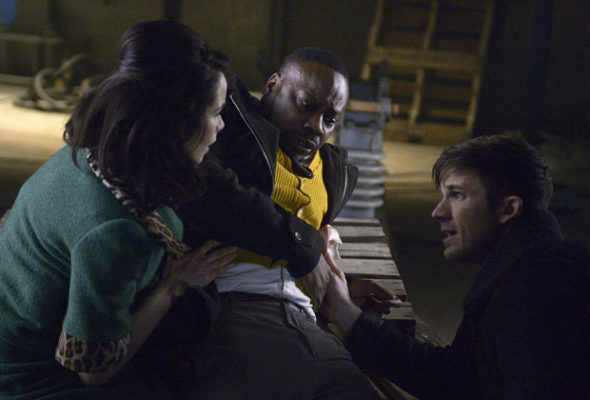 Please, please, please don’t cancel Timeless!!! It’s such a great show! I love the history and the fact that it’s different that everything else out there. I also like the on screen chemistry between Abigail Spencer and Matt Lanter – there are miles of storyline to explore there, not to mention all the storylines still left open at the end of season one. It would be a terrible shame to cancel this now. Love the show…please don’t cancel it! Love the show….please don’t cancel it! Great show….please don’t cancel it! It would be a travesty to cancel this show!! Entertaining and educational as well. This series is well written, most of the cast are solid actors. There have been issues with the Paint Dept, particularly the leadership, many turnovers due to the Coordinator’s attitude. The crew that worked on the pilot should have had the season unfortunately it went with a different one.